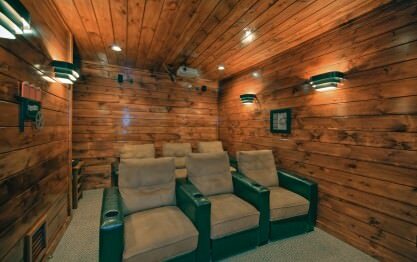 A premier luxury cabin with home theater room and sauna. You'll enjoy 3 king suites each with a jacuzzi tub and 2 with rain showers. The kids will enjoy the queen over queen bunk room with private bath. 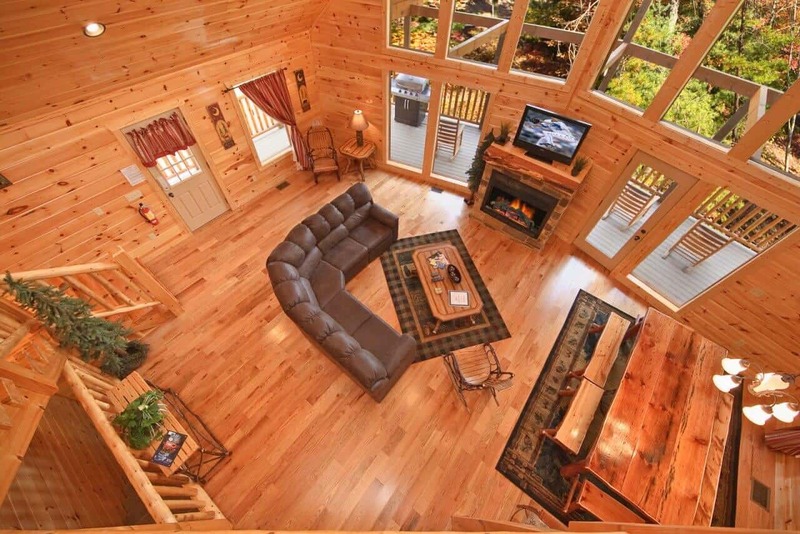 This cabin is about family and gathering as it was designed specifically with 2 main spacious gathering areas where adults and kids can congregate together -or- spread out so the adults can have a space to themselves while the kids play in the lower level. 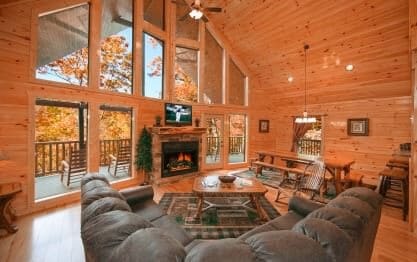 The great room with 28 foot floor to ceiling windows and center fireplace is the main area to gather in the Lazy Daze Lodge in Gatlinburg, TN. Plenty of room to spread out on the sectional couch as well as the adjoining dining area and breakfast bar. 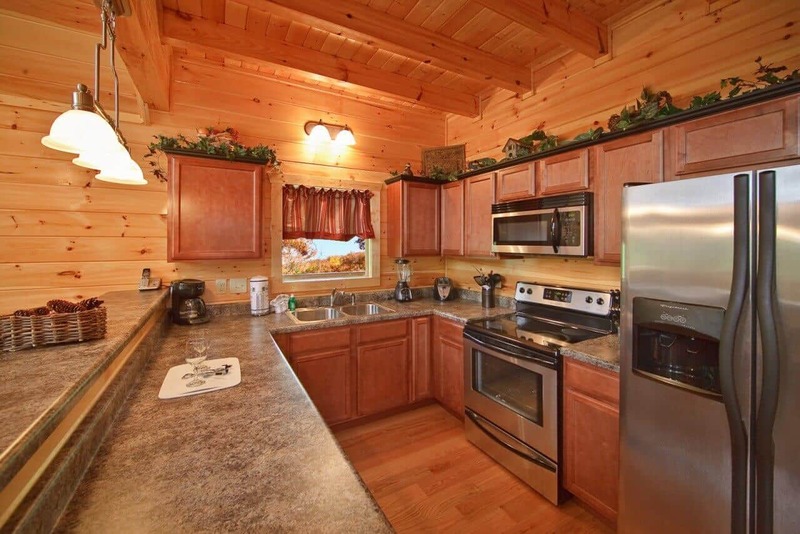 The fully equipped kitchen is perfect for preparing meals right in your cabin....and don't forget the gas grill just out the dining room door. 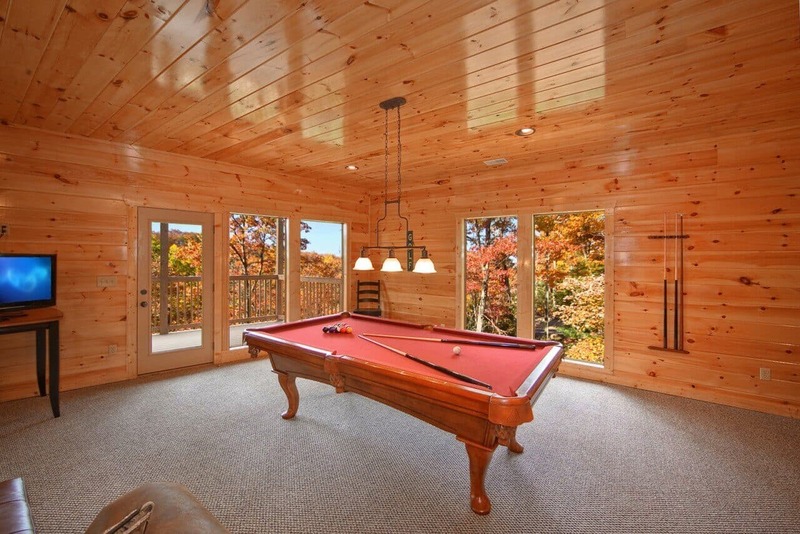 When you and your group are looking for some recreation, enjoy the the pool table and air hockey table, or relax in the indoor sauna on the lower level. 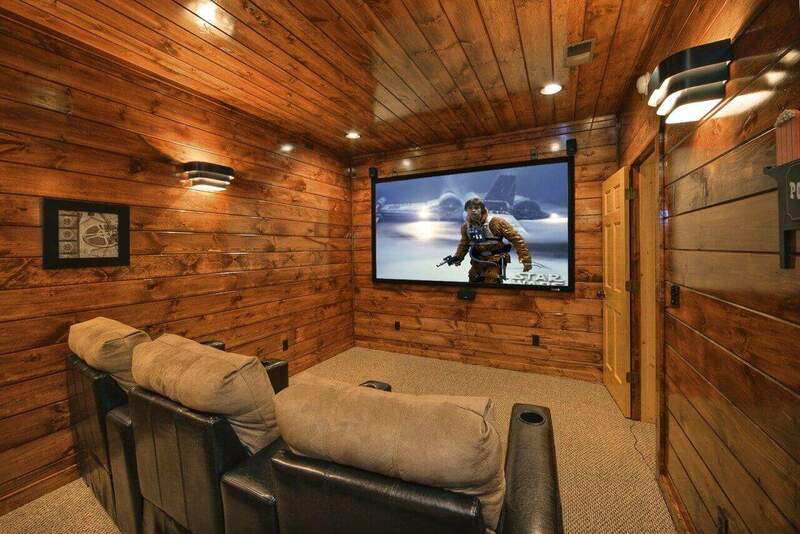 Plus, there is a 9' screen in the theater room with theater seating and surround sound -- just another great addition to this 4 bedroom cabin. 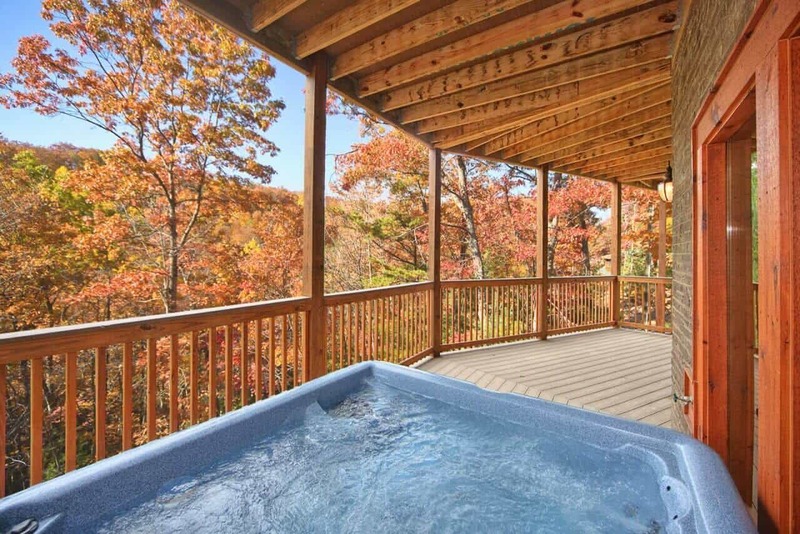 Enjoy the hot tub on the deck and sit in one of the 8 rockers on the decks surrounded by nature. 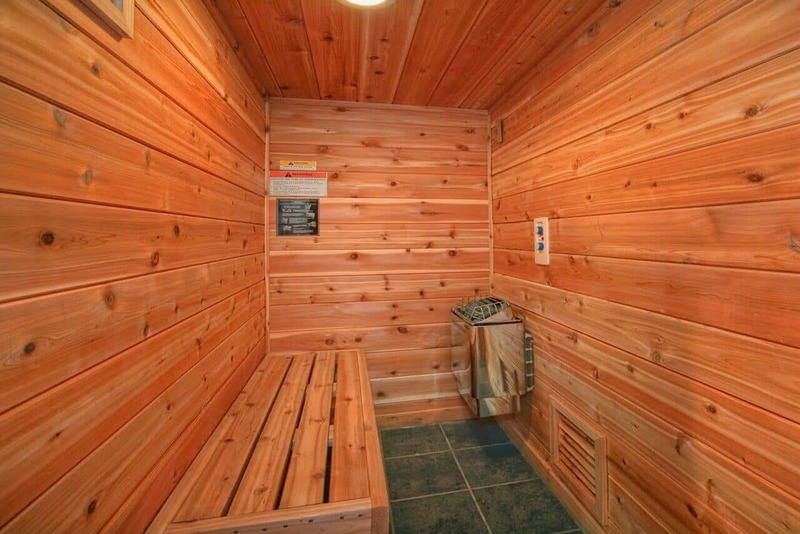 Or maybe soothe the stress right of you in the sauna cedar lined sauna room. The main level master suite has romantic decor complemented by the adjoining bathroom's jacuzzi, stand up shower and double sinks. The upper level has 2 king master suites with jacuzzi tub and rain showers. There is also a loft sitting area on the upper level tucked next to more beautiful windows so you can steal away and have some quiet reading time. The lower level has 1 queen over queen bunk bedroom, a full bath, pool table, air hockey table, game table and wet bar plus a queen sleeper sofa. There is also a flat screen TV to watch while playing games or stretching out. When you wake up each morning, you'll feel revived by the tranquil setting. 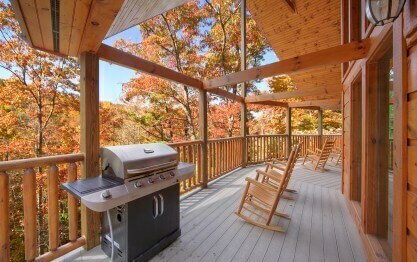 Just sit back on one of the rockers on the covered wrap around deck to soak in the great smoky mountains. You can truly have lazy days while living in this luxury amongst invigorating surroundings. We appreciate your business and your fantastic 5-star review, Jessica! It is great to hear of another successful family retreat with our rental company. 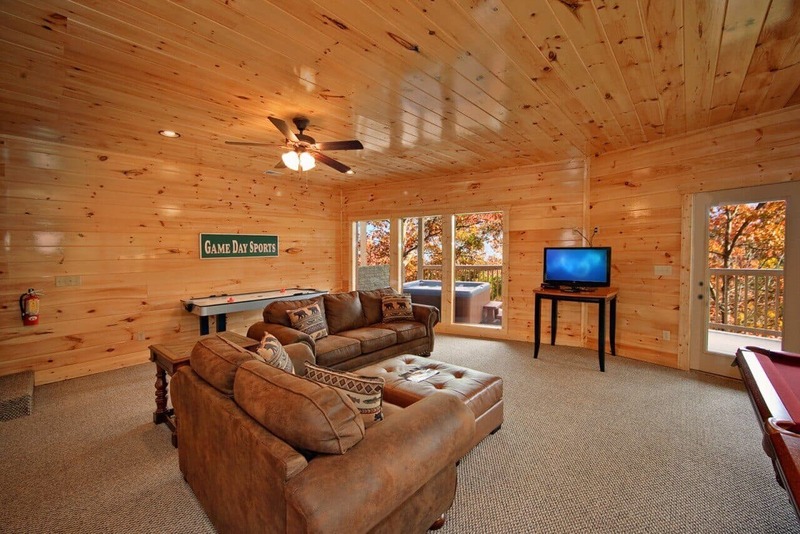 You certainly chose a great cabin for your family to relax in and create memories that are sure to last a lifetime! We strive to ensure that each of our guests feels as though they have a home away from home while in our area. We look forward to working with you in the future. Remember, as a repeat visitor you will save 10% on future stays. Thank you! 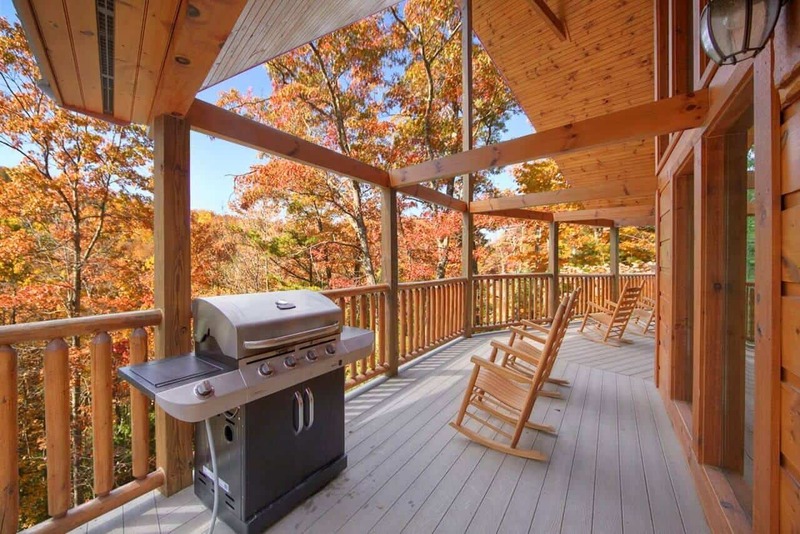 I rented out this cabin with several family members for chrritamas and it was a huge hit! 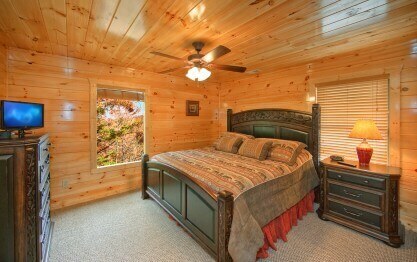 We had plenty of room to sleep, it was easy to get to, and we were within minutes to downtown Gatlinburg! We loved every bit of the experience. Thank you for your kind review, Tracy! We are delighted to hear your stay was exceptional. We enjoyed having you as our guest and hope you will consider staying with us again in the future. Please keep in mind, as a returning guest you will enjoy 10% off all future stays. Hurry back, your next adventure awaits! Thank you for your wonderful review! You are correct, life is good! We are happy to hear your plan of total rest and relaxation was successful. 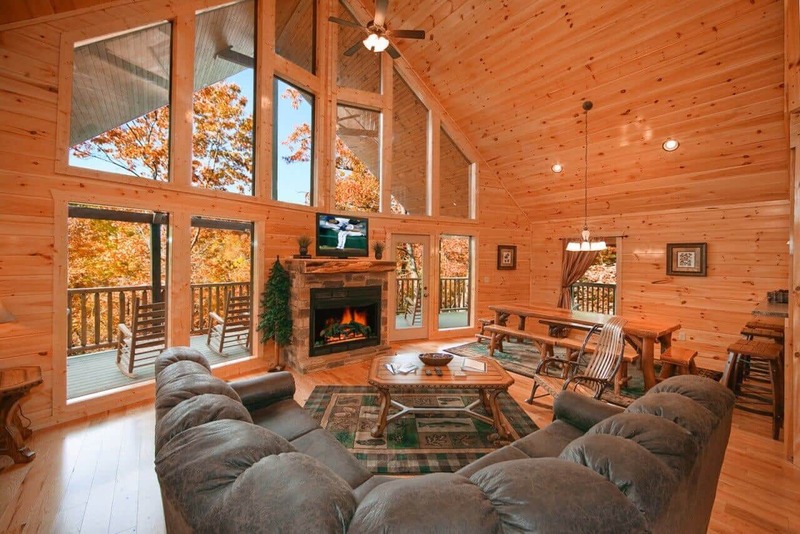 This is the perfect cabin to unwind and recharge! We enjoyed having you as our guest and look forward to your next visit. Thank you for your wonderful 5-Star review, Marty. We are excited to hear your stay was exceptional and hope you will visit again soon! My friends and I had a great weekend away at the lodge! 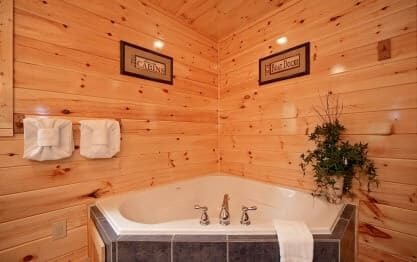 We loved the woodsy feel, sitting on the porch with coffee in the mornings, the hot tub at night, and everything the house has to offer! We appreciate your business and your wonderful review, Kristen! 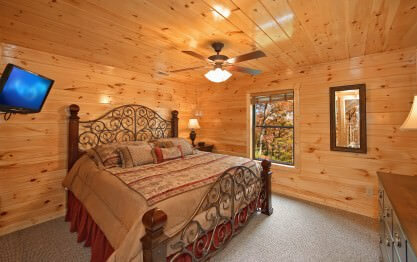 Lazy Daze Lodge is a fantastic cabin for large family or group to have fun and make memories that will last a lifetime. We hope you will make plans to visit with us again very soon! Please keep in mind, as repeat visitors you will enjoy 10% off all future bookings. Hurry back, new memories are waiting to be made! Property was very big and more than enough for our group of 7 adults and a kid. Very neat and spacious. Had all the needed amenities. 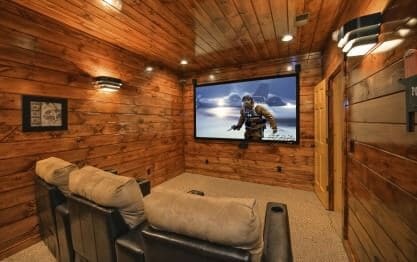 Awesome game room and home theater.Had a great time and would love to rent this property again. Thank you for your wonderful review! We are delighted to hear you enjoyed your stay and would consider it an honor for you to stay with us again. Please keep in mind, as a returning guest you will enjoy 10% off all future stays. Hurry back, new memories are waiting to be made! We really enjoyed ourselves. The cabin was nice and cozy . I loved the gas fire place , we didn?t have to go through the trouble of finding wood. 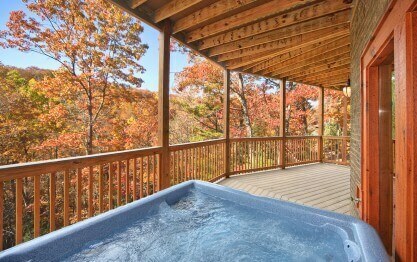 The hot tub was amazing after a few falls on the ski …slopes . Ha!! I will say you should bring your own DVDs for the theater room (which has great surround sound ) felt like we were at an actual movie theater. Overall I get it a 10 . Thank you for your wonderful review, Kendra! We are delighted you enjoyed your stay at Lazy Daze Lodge. We also recommend bringing your own DVDs for the theater room, as these are not provided at most of our cabins. There is a Red box at our local grocery store, Food City, which is less than 10 minutes from the cabin for added convenience. We enjoyed having you as our guest and hope you will consider staying with us again in the future. 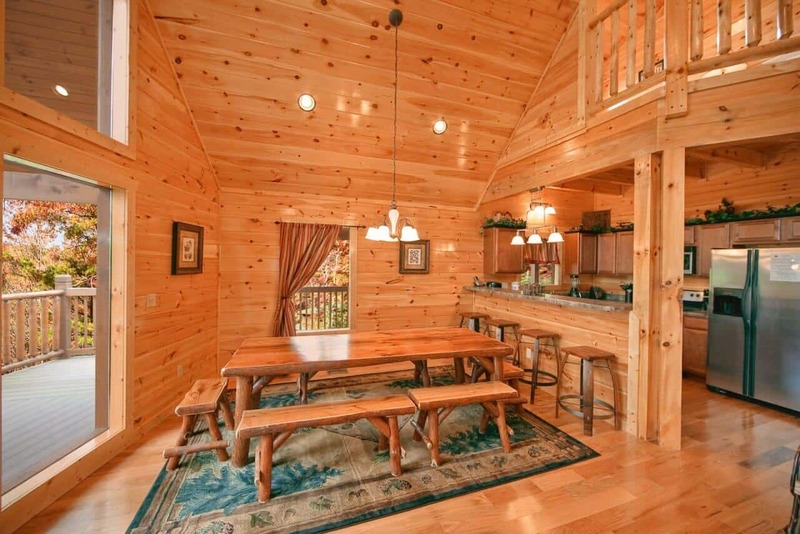 A large, yet cozy cabin big enough for the whole family. Plenty of entertainment for the kids as well as adults. 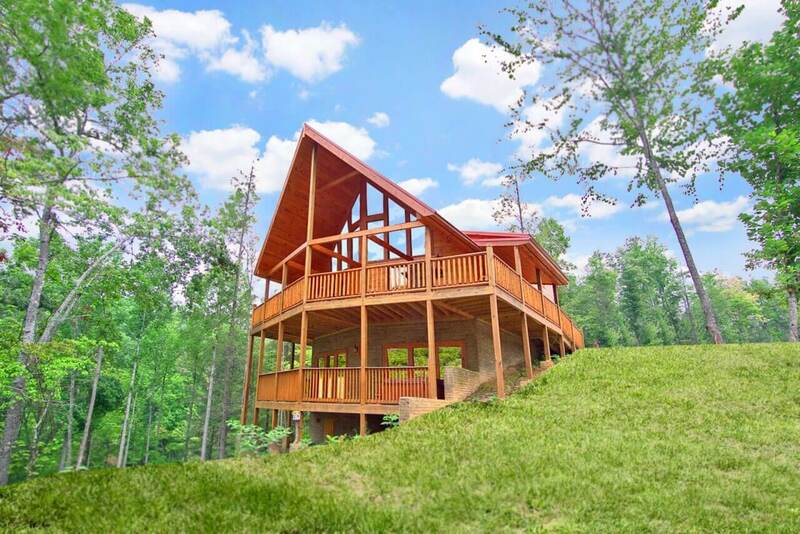 Great location, convenient to Gatlinburg and Pigeon Forge. Very clean and neat. Would definitely stay here again. Thank you for your wonderful 5 star review, Jason! We are pleased that you and your family enjoyed your stay at Lazy Daze Lodge. You certainly chose the perfect cabin to relax and create lasting memories together. We hope you will make plans to visit again very soon. Please keep in mind, as repeat customers you will enjoy 10% off all future bookings. Hurry back, new memories are waiting to be made! It was very good property and we have enjoyed a lot. I will refer to my friends and family members. Thanks!! Thank you for your wonderful review, Uday! We are happy that you enjoyed your stay at Lazy Daze Lodge this weekend. We appreciate all recommendations and we hope you will join us again very soon! "Fall Retreat for the Family "
Everything was great this was our 5th stay with you. We really enjoyed it, we always will use you for our Gatlinburg getaways! Thank you for your loyalty to Elk Springs, Michael. We are so delighted that you and your family were able to join us again! 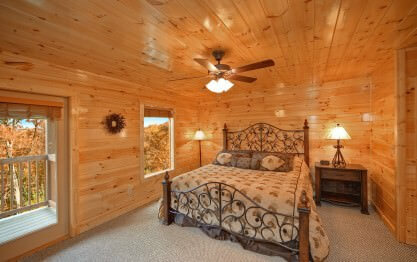 Lazy Daze Lodge is definitely has plenty for the entire family to enjoy. We hope you will join us again very soon! We are ecstatic that you had such a great time at Lazy Daze Lodge! We hope you will consider joining us again during your next visit to The Great Smoky Mountains!. 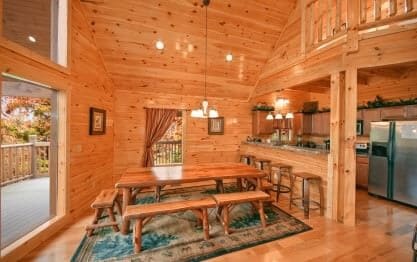 We've been visiting the Smokies for 25+ years and Lazy Daze Lodge is by far the best cabin we have rented. Will be back!! We love to receive reviews such as yours, Calvin! We strive to make each visit truly memorable by offering exceptional, luxury cabins along with extraordinary customer service throughout every aspect of your stay. We enjoyed having you as our guest and would consider it an honor for you to stay with us again. Please keep in mind, as a returning guest you will enjoy 10% off all future stays. I rented the Lazy Daze Lodge as a surprise to my fianc� for his birthday along with a couple of our closest friends. The pictures did not do the cabin justice. The space and environment was amazing. E…verything from the living area, to the kitchen, theater room and bedrooms were comfortable and beautiful. The Elks Spring Resort Representatives were very helpful and informative by calling, texting and emailing every step of the way before, during and even after we arrived. The only downside to our whole weekend was the fact we did not stay long enough! Thank you for the nice 5-star review! We are pleased that your surprise trip for your fiance' turned out even better than expected. We hope you can return soon for a longer trip and bring along some more friends! "Wonderful cabin. Plenty of space for 4 adults and 4 children. " We had a wonderful time at the Lazy Daze Cabin. It was everything as described. Property was clean. Great customer service. We had to call for trash pick-up 2 times ( we cooked all meals so there… was an overflow of trash) and it was picked up within the time frame indicated. We loved it and will be back! Thank you for taking the time to share your wonderful experience with us, Dana! We love to hear how much you enjoyed your stay. We enjoyed having you as our guest and hope you will consider making Elk Springs Resort part of your holiday plans for many years to come! Please keep in mind, as a returning guest you will enjoy 10% off all future stays. Hurry back, new memories are waiting to be made! "Lazy Daze Lodge Family Vacation"
We had a great experience. The staff started making sure we were ready for our vacation by sending us emails, texts and even phone calls to make sure we knew how to get to the cabin and that our stay …was going great; great customer service. The cabin was great for our family of 12 and everyone had their own space to take advantage of the relaxing time! Thank you for your 5-Star review, Aaron! We are excited to hear you enjoyed your stay. We take pride in providing exceptional customer service during each aspect of your stay. We enjoyed having you as our guest and hope you will consider staying with us again during your next visit to Gatlinburg. Please keep in mind, as a returning guest you will enjoy 10% off all future stays. Hurry back, new memories are waiting to be made! Family getaway for Christmas in the Smokey Mountains! We had a great time and the house was perfect! Thank you for allowing us to be a part of your family vacation, Michelle! We certainly agree! 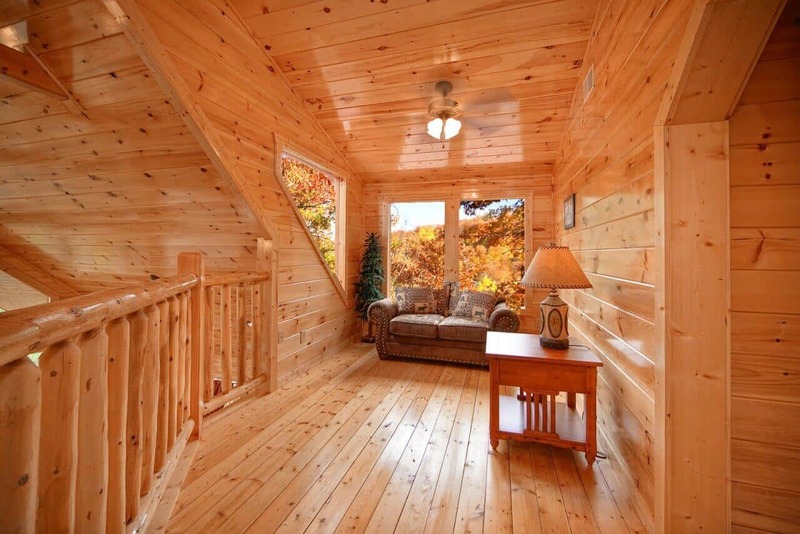 Lazy Daze Lodge is a wonderful cabin and perfect for a family getaway. We do hope you will consider Elk Springs Resort for a future stay. Please take advantage of your 10% repeat guest discount at the time of your next booking! Hurry back, more memories are waiting to be made! Excellent. Great hot tub, spa, and theater room. Thank you for choosing Elk Springs Resort as your vacation destination! We appreciate your business and positive feedback. Glad you enjoyed the cabin as well as all the amenities it had to offer! Thank you for the 5-star review! What a great birthday surprise, Michael! I think you made the perfect cabin choice for your wife's celebration. We are pleased that everyone had a great time. We would love to have you back for a future stay. Our repeat guests receive a 10% discount off their next stay with us! The staff was great. Could have had a later check out time with the amount you pay to stay here. Thank you for your review, Jeniffer. Late check outs are available upon request and we are usually very accommodating with this by giving you an extra hour or two without an additional charge. Please understand that we have to have a set check out time in place to allow our housekeeping staff to have ample time to clean each cabin. Customer service is very important to us and we appreciate your feedback telling us that our staff was great and that you enjoyed your cabin vacation experience! 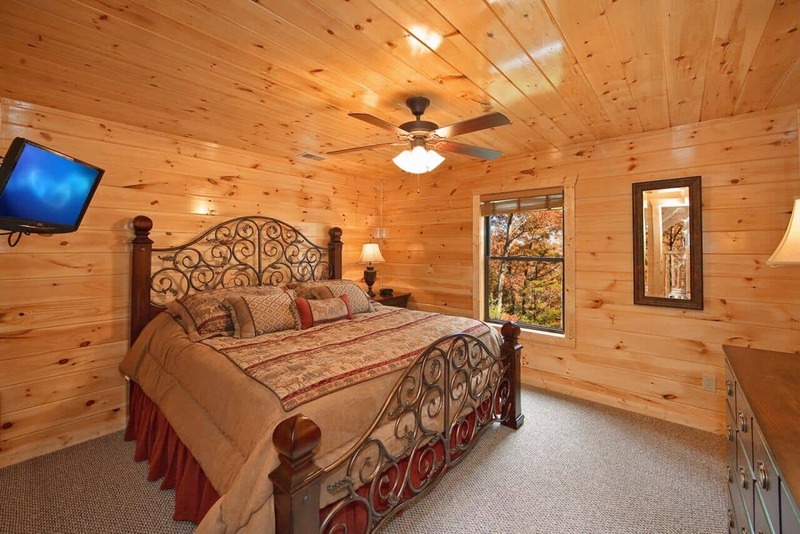 "Our stay was Great and the cabin was immaculate!" The cabin was roomy, clean, spacious, immaculate and enjoyable!!! The kids loved the theater room. The bedrooms were very spacious. The staff was very courteous. We are looking forward to another trip to Elk Spring Resort! We are delighted to hear you enjoyed your visit, Gladys! It's a beautiful day here in The Great Smoky Mountains and the perfect time to start thinking about a return trip to Gatlinburg. Please keep in mind, as a returning guest you will enjoy 10% off all future stays. We hope to see you soon! great cabin! kids loved the place! 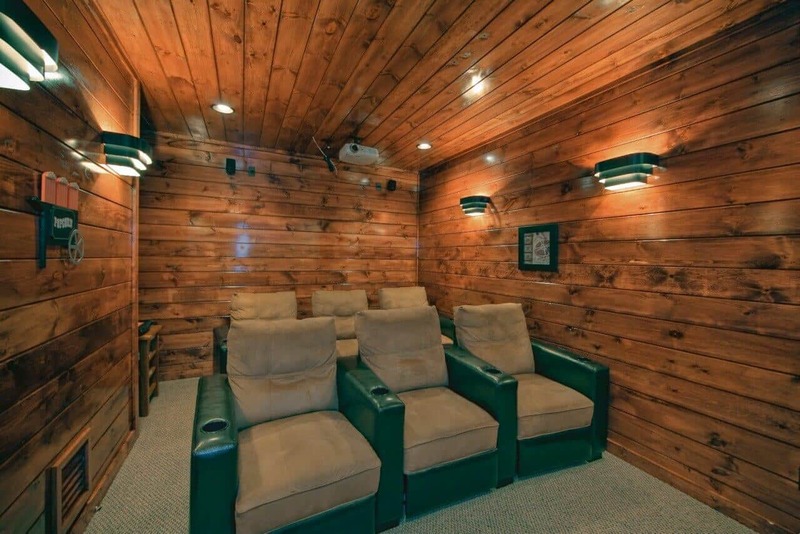 We loved the theater room and hot tub didn't want to leave. "A lovely getaway with the familey"
I loved the family feel to this cabin. It's spacious. The atmosphere is sooo relaxing. I will definitely be back. Our group was quite content with Lazy Daze Lodge. We would have no argument whatsoever about staying here again. We had a great weekend. Unfortunately, we weren't there long enough to thoroughly enjoy all of the things the cabin had to offer. Nice cabin all as described. Clean place with lots of room. "Great time with the teenagers!" Cabin was big enough for both the grownups and the teenagers to enjoy their stay! Would go back. Stayed at Elk Springs Resorts Lazy Daze cabin in July, 2014. We never wanted to leave. The cabin was he best part of our trip. More room than we needed and the cabin was beautiful and clean. 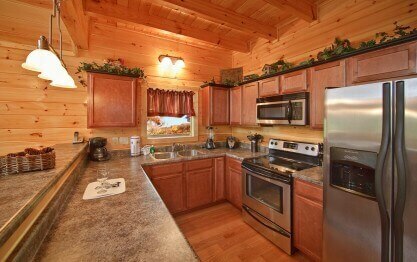 Best …parts of cabin were the fully stocked kitchen supplies, the washer and dryer and the media room. The location and view were good. Would go back in a heartbeat. 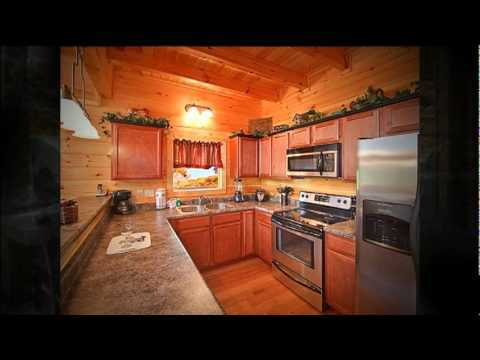 "One of the best cabins"
Would definitely rent with Elk Springs again. Went with 23 family members in 3 cabins. Had a great time. Can't wait until we return. We had a fantastic stay at Lazy Daze! The house was very clean. Elk Springs staff was very nice and very accomodating of all of our requests. We enjoyed all of the amenities and we are looking forward to staying again next year! "Lazy days at Lazy Daze"
Cabin was perfect for our family weekend. Lazy Daze was spacious enough for the 11 of us. We enjoyed the hot tub and the movie room plenty. 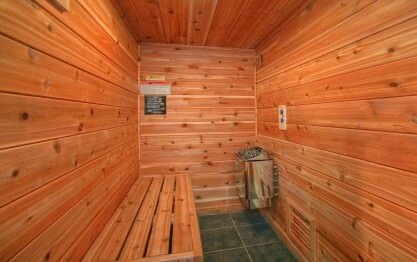 Though there were other cabins nearby, it felt rather privat…e compared to some of the other cabins. Highly recommend. We shared the cabin with 3 families and had a great time. Beautiful cabin and clean. The kids had a ball with the theater room, air hockey table and hot tub. 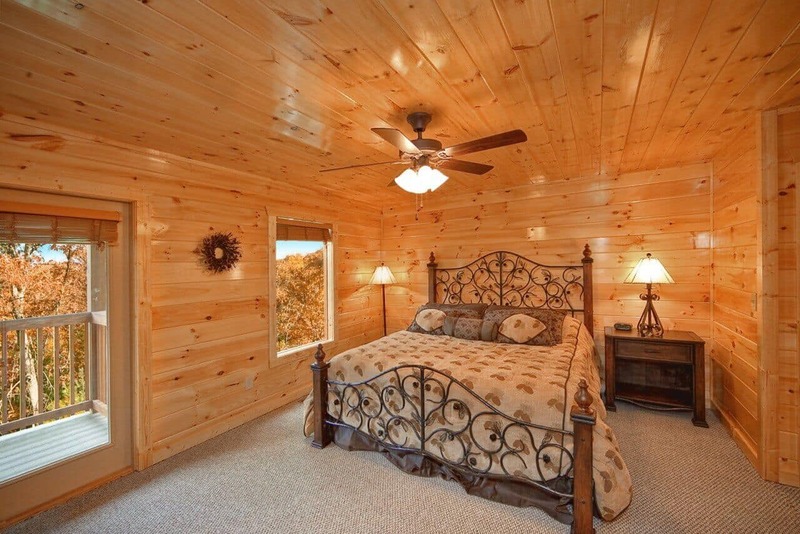 Don't hesitate to book this cabin! Elksprings Resort Luxury cabin was just as I said AMAZING. What a wonderful get-away. When we arrived it was wee-morning, so it was very dark. When we entered the cabin (Lazy Daze) boy oh boy we were …truly impressed. The cabin was very clean and the decor was warm. we were there for 3 days and really regretted not being able to say longer. We made the very best of our time, had movie night every night in the theater room, got in the hot tub after breakfast, grilled out for dinner. We had a very relaxing stay. Most definitely would do this again. 2 thumbs up. Cabin was great. Can't wait to go back. Our group had a wonderful time at Lazy Daze Lodge. We hope to return next year. Four famlies shared this cabin with room to spare. We gad a very enjoyable time. The cabin was clean and ready for us at check in. I would recommend this cabin the views were spectacular and it isn…'t right on top of other cabins. My only complaint is that the air flow between the middle level and the lower level was not good. The lower level stayed very cold. The good thing was that the teenagers stayed down there. "great retreat and even better anniversary"
Spent the weekend here with my family.Lovely, new, spacious cabin with nice furnishings. Lots of open space for family to gather around the table to play games or watch TV. The only downside is there is not much of a view. The cabin is great. We loved it. We had a great time. The cabin was beautiful and very spacious. 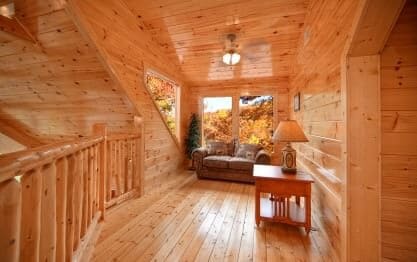 We rented the cabin and invited or closet married couples friends for our wedding vow Renewal. My husband and I renewed or vows in front of the fireplace. It… was really beautiful and intimate. Our friends loved our idea. This was an incredible location, the house was beautiful and the weather was perfect! The only problem was that the trip wasn't long enough! We will definitely be back at another time. Enjoyed the cabin very much. Very nice amenities. The only criticism is that the cabins are very close together and doesn't feel very private. My friends and I had the most relaxing weekend at Lazy Daze Lodge cabin in Elk Springs Resort! It was beautiful and full of so many things to do, we stayed in the cabin all weekend! 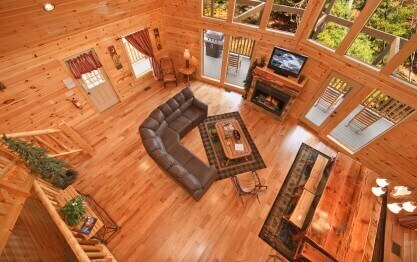 The cabin was cl…ean and the furnishings were beautiful! We decided to have our annual girls weekend with Elk Springs Resort!! 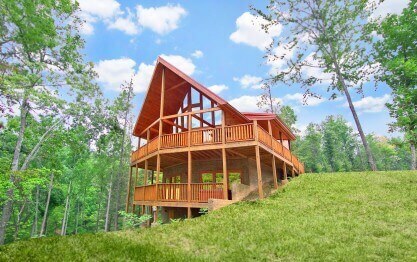 Lazy Daze cabin was the perfect cabin for our 4 couple get away! The living room and dining room were large enough to accommodate us all, and we each had our own bedrooms. The basement area was a bi…g hit as well! I had stayed in another cabin offered by another rental company a few years back, and although it offered the same amount of 'sleeping' space, it was MUCH smaller. Oh, the 'rain showers' were a big hit with everyone as well!! :) I would highly recommend Lazy Daze to anyone looking for a large place in Gatlinburg. The staff was always very helpful throughout the entire process! My husband and I stayed for 3 nights and all I can say is warning...read the sign when entering the resort that states "caution you may not want to leave" because that is exactly what happened to us, …the stay was not long enough, we plan on returning shortly but for a much longer stay. Everything was great, I highly recommend this resort to anyone looking for a vacation spot, whether it be a family vacation, honeymoon, anniversary, or just a plain out relaxation get away, what ever the occasion may be you will not be disappointed.